Little toes need lots of warmth, and babies of all ages are sure to love these Precious Crocheted Baby Booties. Great for little ladies, these crocheted baby booties are simple enough for a beginner to make in a couple hours. 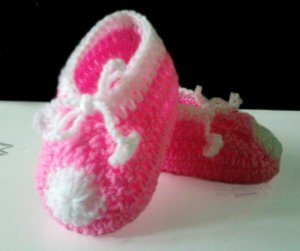 Once you get the hang of crocheting these sweet baby booties, you'll be able to make them in a wide spectrum of colors. Soft pinks, blues, greens, and yellows are great for making crocheted baby projects, and a collection of crocheted baby booties makes a great gift for expecting parents-to-be! ch 4 with white, sl st to first ch, made a ring, ch 3, 14 dc in ring, sl st to beg ch 3, fasten off. Row 4: turn the work WS, Now we are going to work from last st of previous row. Get one motif and hold it outside (RS) near to last st of the previous round to attach the motif. (WS) ch 1, insert the hook in last st of previous row and in any st of the motif. Yarn over, pull back the yarn through the 2 sts and loop on hook at once, [ch 1, insert the hook in next 2 sts of the bootie and the motif, yo, pull back through the 2 sts and loop on hook at once] 7 times. Row 7: ch 3, sk next 2 dc of side of bootie sl st to next, turn, dc in next 3 st you just crocheted. sk 2 dc of the side of bootie and sl st to next. Fasten off and weave the end. ch 4 with white, 4 dc in 4th ch from hook, ch 3, sl st to same ch, ch 40, do not fasten off, keeping the loop on hook, yo, insert the hook through next st of you fastened off last in the bootie. Make a dc stitch, dc in next 26 sts, ch 44, 4 dc in 4th ch from hook, ch 3, sl st to same ch, fasten off. The pattern has 6 parts to crochet. First crochet 2 motifs and keep it aside. Then you want to crochet sole of the bootie, attach the motif to the sole, crochet sides of the bootie after attaching the motif and crochet 2 rows to finish instep. Finally, half of dc stitches round with 2 straps. I was very disappointed after spending a few hours trying to make this pattern work. It definitely has some sections missing and although I tried to adapt it, it would not work, so I had to abandon it. Such a shame. I recommend that it should be removed until it is corrected. Is there a tutorial for this pattern. I have been unable to finish the pattern. Definitely some directions missing... Directions don't match up to the stitches... Go from 48 stitches and lose five without them being accounted for and same for the next step. Hope the designer updates this soon as it's a cute bootie! The pattern has now been updated - thanks! I don't understand how to attach the motif to the bootie. I need help on rnd 4. Hi there, I have reached out to the pattern designer and will update the project when I received more information. Thanks! Hi again, The designer is going to rework the pattern and send edits as soon as possible. Thanks! Hello...Yes it does says chain 10 and then chain 3. The chain 3 is considered as a double crochet to start off the row and then to double crochet from the 4th chain from the hook to make it the second double crochet. Hope this helps.